Are you doing magnetic resonance research (MRI, MRS, EPR)? Are you keen on learning cool new stuff and hanging out with leaders in the field. Why? Let me count the ways! 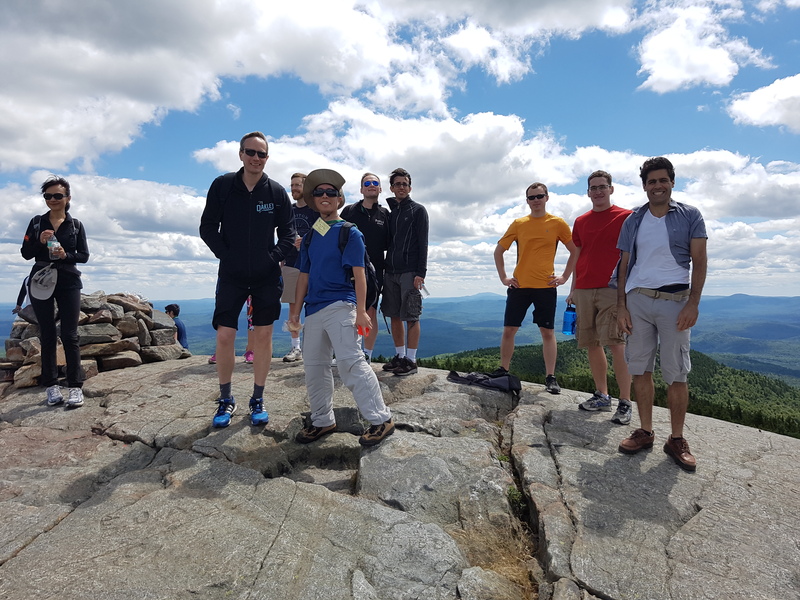 Attendees and intrepid hikers from the Gordon Conference on In Vivo Magnetic Resonance—the famous Mt. Kearsarge hike. My students have said that this is the best conference they have ever gone to. It is one of those small group meetings where you get to talk to everyone. Gordon Conferences are a special genre. The Gordon organizes sites, and all the meeting logistics. The organizers can focus on creating a great program. The program is required to have time for discussion and there are no parallel sessions. People often come and don’t even present. They are there to learn what’s new and to discuss science with leaders and trainees. One of the very unique things about the “Gordon” is that it is a closed meeting. It isn’t “invitation”, but you do have to submit an application. There is no abstract book. Photographs are not allowed without specific permission. What this means is that everyone’s intellectual property is protected. This conference is aimed at learning what is happening at the forefront of field. People can, and do, discuss what is new in their lab—not just what is already published. It was the Gordon that hosted many of the early meetings where the idea of MRI was tossed around, ridiculed, and formalized. Applications for this meeting must be submitted by June 17, 2018. Posters are encouraged so bring it on. These will be relaxed sessions where everyone will have time to meet people at the poster sessions. For the first time, this Gordon conference will have a “Gordon seminar” just before the main meeting. This is aimed at giving trainees a leg up about learning the technology and new concepts. Apply by April 14 to be eligible for consideration for an oral and June 16 for the conference. So—great science, cutting edge AND time to meet people—not just hear them while they blather on behind a podium. Attendees and speakers are encouraged to stay for the duration so you have time to make friends and go away with new colleagues. There are many late night brainstorming sessions sitting on the lawn with the stars overhead (hope for no rain!). There are organized social events every day including the now famous Kearsarge hike with fantastic views of New England. Kearsarge for fantastic views. Bring walking shoes, a bathing suit for the freshwater lakes and whatever sport gear you might want. Take in organized activities such as canoeing. Partake of the famous “last night” Gordon dinner of lobster (have I mentioned that the food is fantastic and the beer is cheap). Jeff Dunn Imaginer on Why are oxygen levels in brains of MS patients unusually low? Adrafinil on Why are oxygen levels in brains of MS patients unusually low?